YUM! there isn't even a chickpea left on one of the plates, in the pot or in the bottom of the sink. every last bite of this delicious creation was gobbled up...and that was only between two of us! the serving size was perfect. the spices were perfect. this is probably one of the meals I'm most proud of. 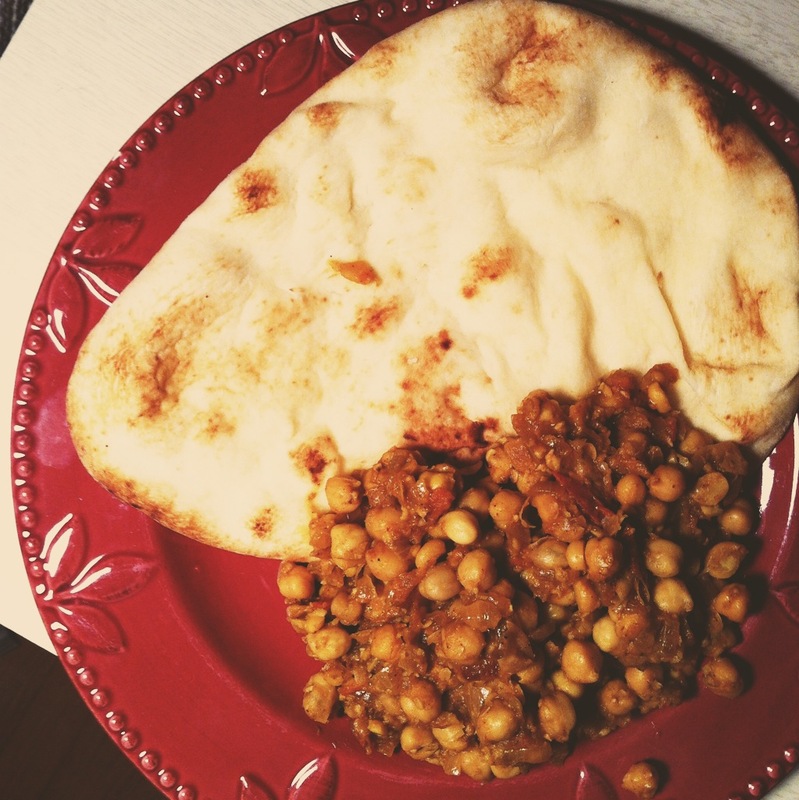 the entire thing (grocery store naan bread included) cost $12 to make. I bought my spices at bulk barn and they came to $1. the chickpeas were $1 and ready for this? the ginger root was a whopping $0.13. this is certainly an affordable meal for a student. and if you want to save $3 you could forfeit the naan and eat it with rice which would be equally as delicious! I googled for chickpea curry recipes after eating the best food (at amazingly affordable prices) at Indian Express. I found one from the BBC that caught my eye simply because of the serving size. I'm not the biggest fan of leftovers so a recipe that will comfortably feed two is exactly what I was looking for. 1. in a deep sauce pan or wok add oil. add onions and garlic and wait for them to caramelize. in the meantime, chop the tomato. once the onions are soft and brown, add the cumin, coriander, salt, tumeric and chili powder and mix for one minute. add tomatoes and stir until the sauce begins to thicken. 2. once the sauce is thick, add 1/4 cup of water and stir. add chickpeas - mash half while they are cooking for added texture. cover and let simmer for 5 minutes. remove lid and add ginger and garam masala and cook uncovered for another 1-2 minutes. 3. serve with naan (which is best if it is heated in the oven for 2-3 minutes before serving) or basmati rice. it was completely satisfying. Andrew is currently passed out on the couch beside me, obviously goes to show what a good meal can do to you! now it's time to wake him up so we can go get some ice cream.